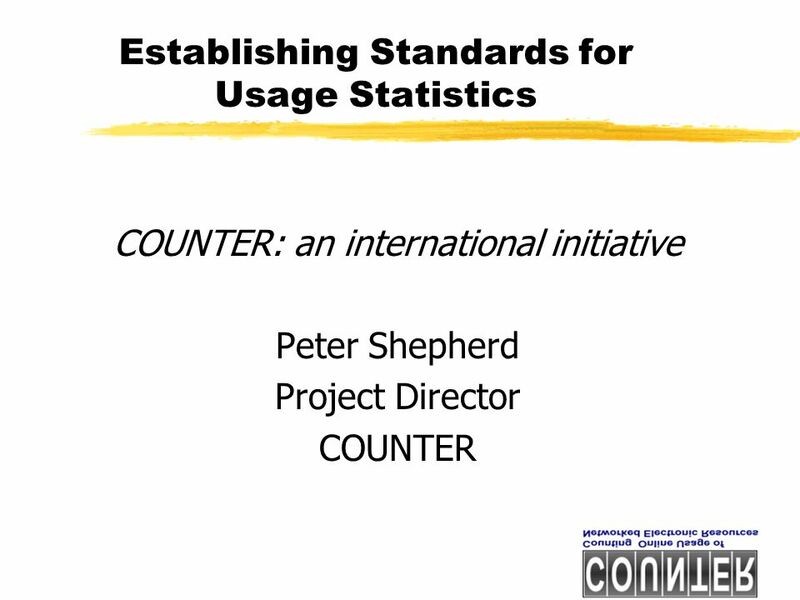 Establishing Standards for Usage Statistics COUNTER: an international initiative Peter Shepherd Project Director COUNTER. 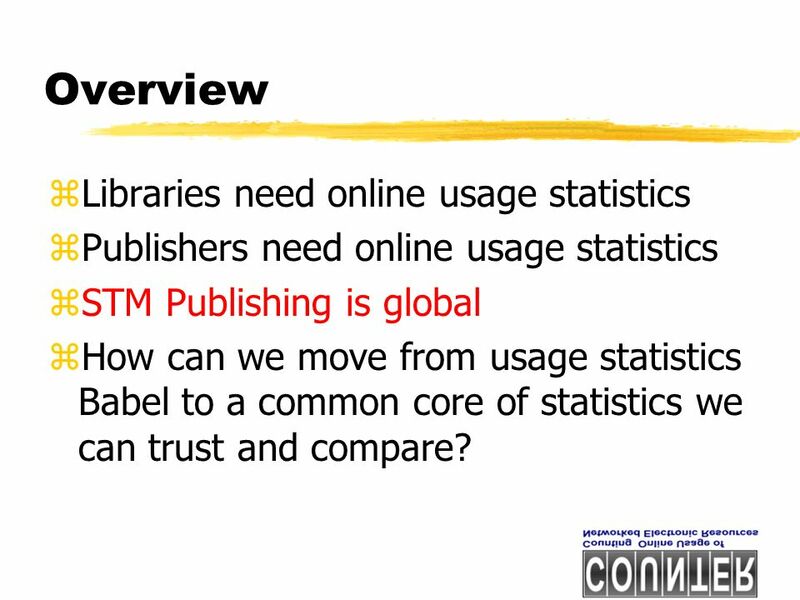 2 Overview zLibraries need online usage statistics zPublishers need online usage statistics zSTM Publishing is global zHow can we move from usage statistics Babel to a common core of statistics we can trust and compare? 22 For more information…….. www.usagestats.org zVisit the site and join the USAGE listserv to be kept up to date with further developments. 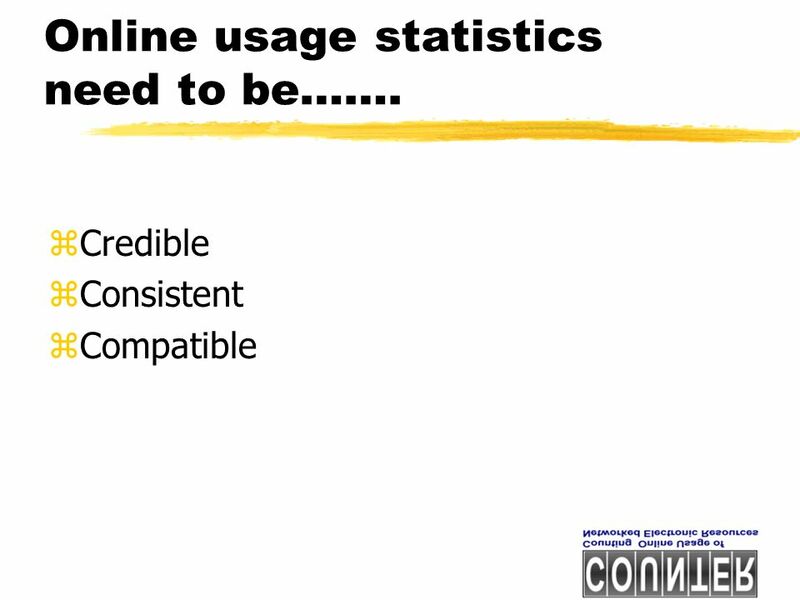 Download ppt "Establishing Standards for Usage Statistics COUNTER: an international initiative Peter Shepherd Project Director COUNTER." 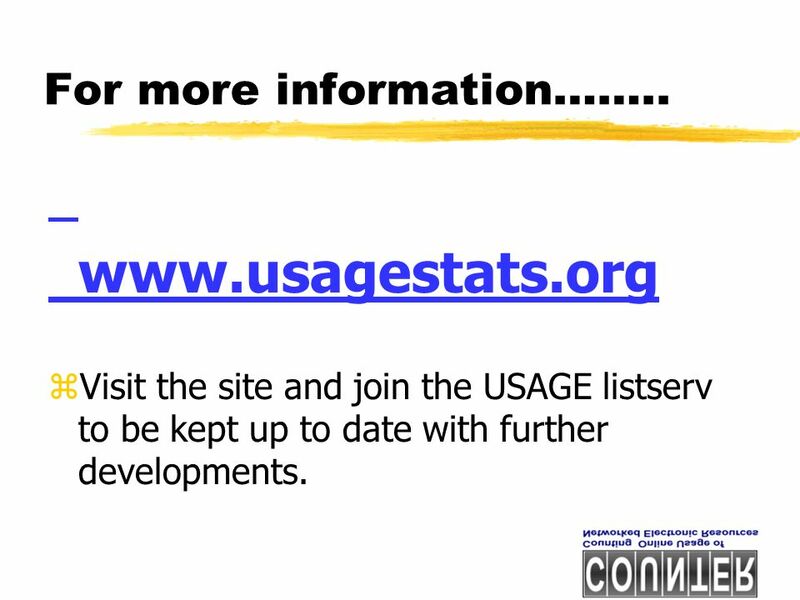 COUNTER: improving usage statistics Peter Shepherd Director COUNTER December 2006. 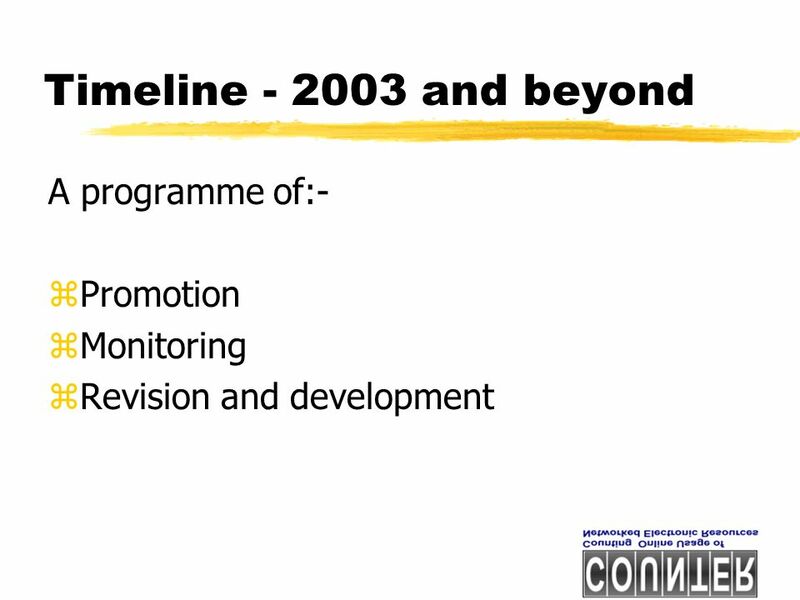 COUNTER: achievements and future challenges Peter Shepherd Director COUNTER April 2007. 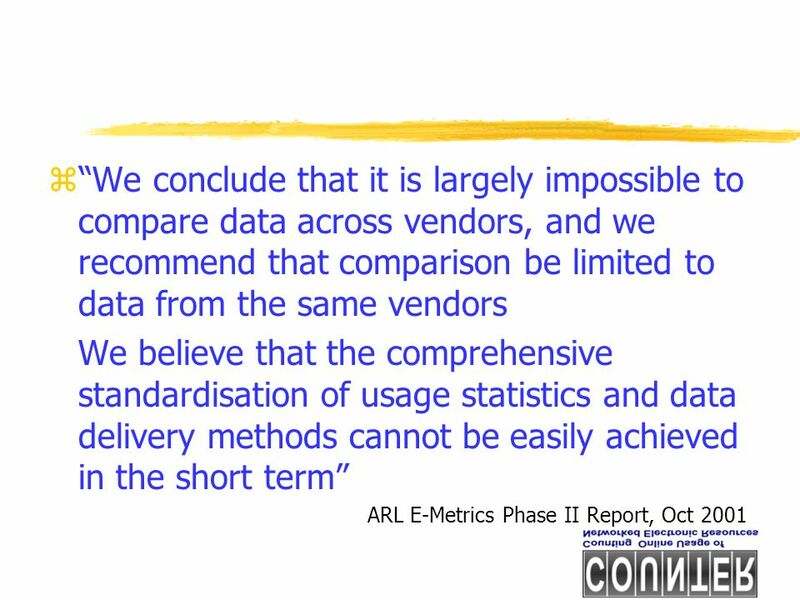 Usage statistics in context - panel discussion on understanding usage, measuring success Peter Shepherd Project Director COUNTER AAP/PSP 9 February 2005. 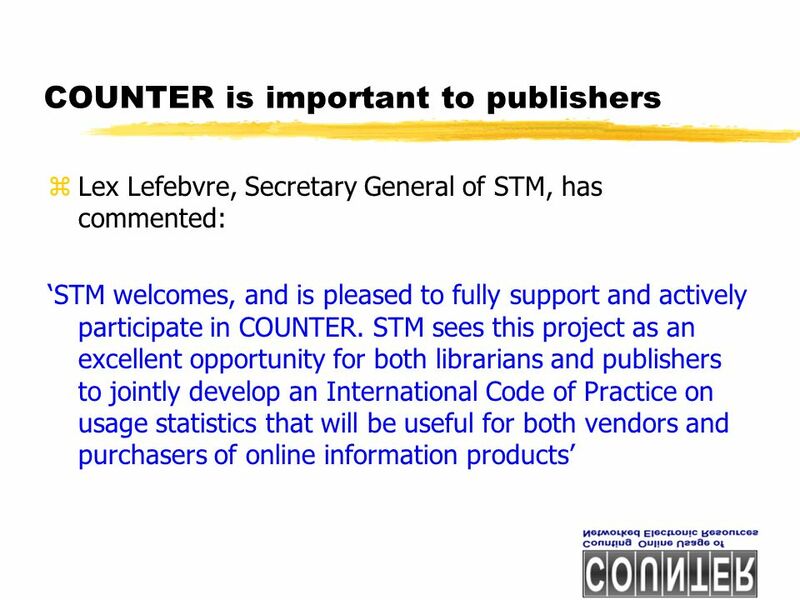 COUNTER Update Peter Shepherd Project Director COUNTER STM Innovations Seminar, 2 December 2005. 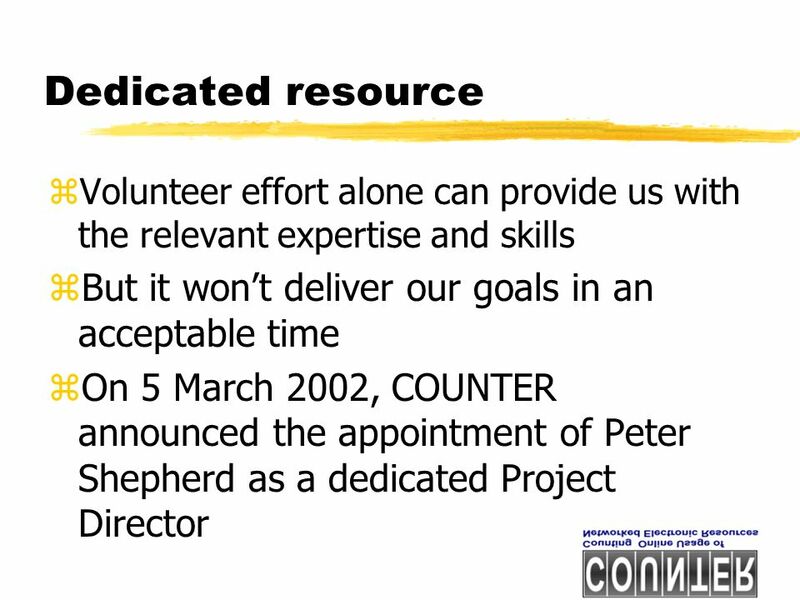 Project COUNTER -a progress report Peter Shepherd Project Director COUNTER. 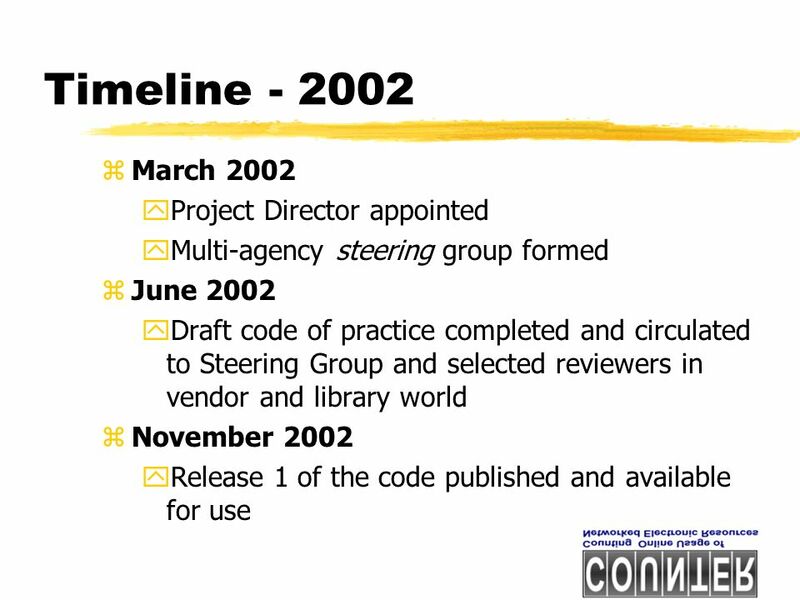 The COUNTER Code of Practice Peter Shepherd Project Director COUNTER. 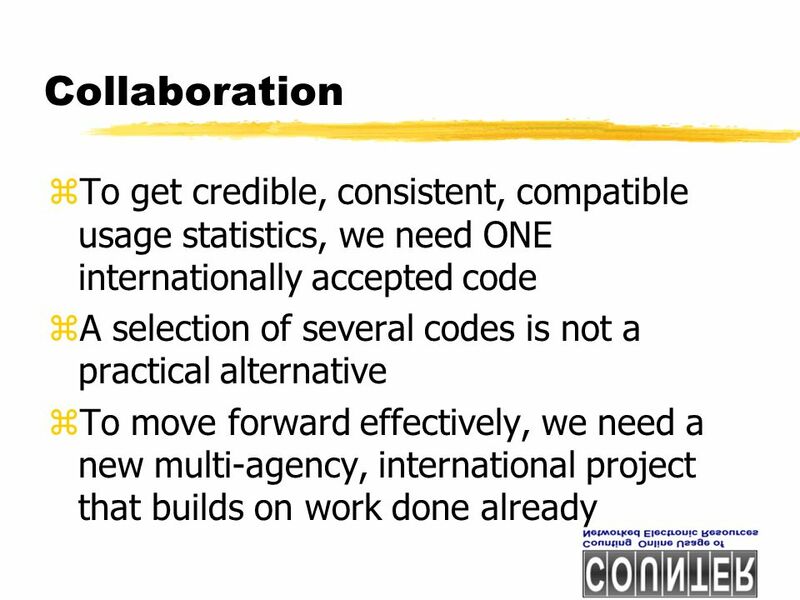 How do we keep track of what we do? 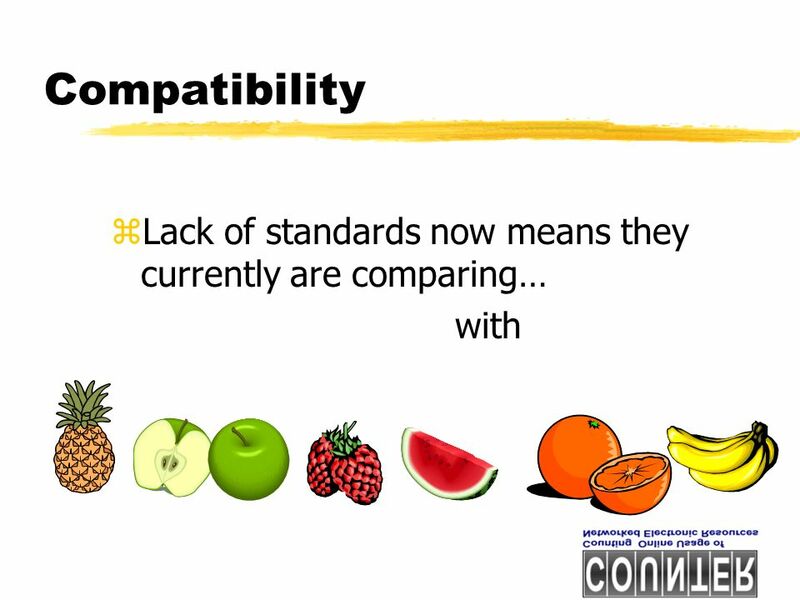 COUNTER now and in the future? Peter Shepherd Director COUNTER February 2008. 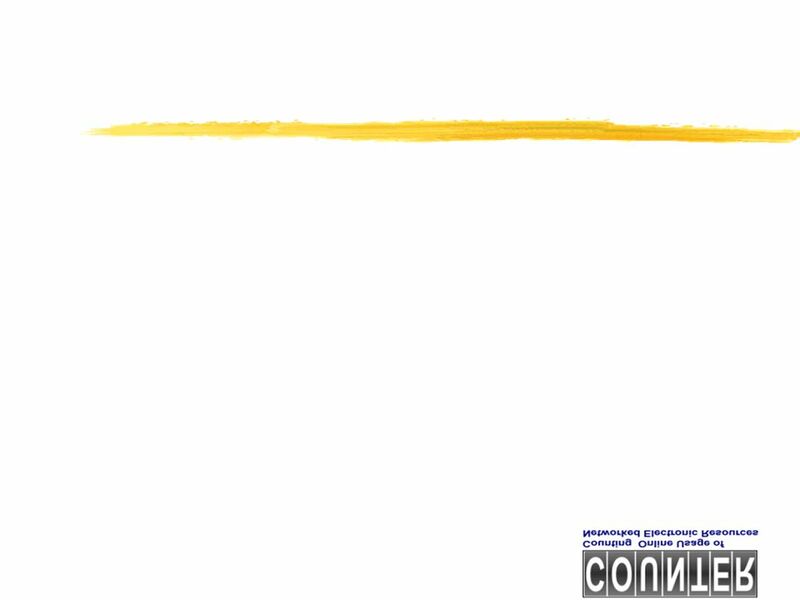 COUNTER Update Peter Shepherd COUNTER May COUNTER - three new developments Release 4 of the Code of Practice Release 4 definitive version now published. 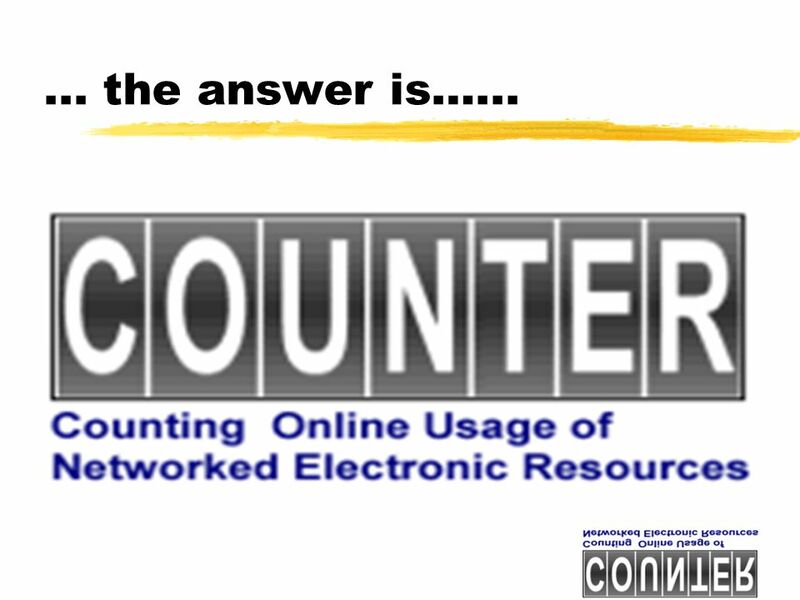 COUNTER in context Where have we got to? Where are we going? Peter Shepherd UKSG, March 2009. 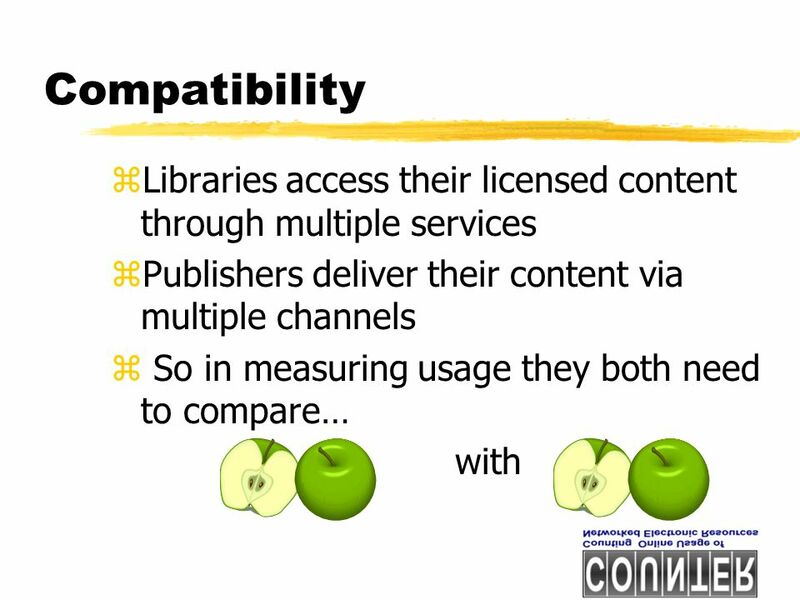 © 2008 EBSCO Information Services SUSHI, COUNTER and ERM Systems An Update on Usage Standards Ressources électroniques dans les bibliothèques électroniques. 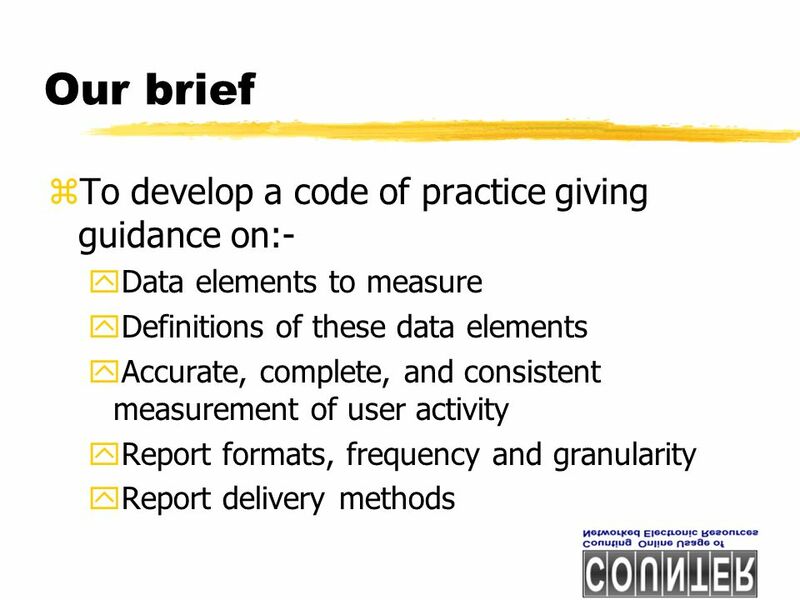 GEOSS Data Sharing Principles. 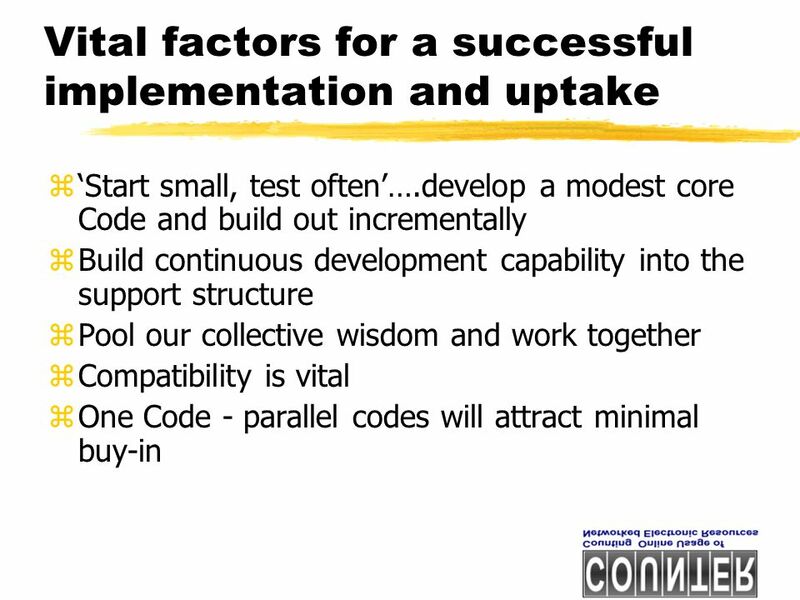 GEOSS 10-Year Implementation Plan 5.4 Data Sharing The societal benefits of Earth observations cannot be achieved without. 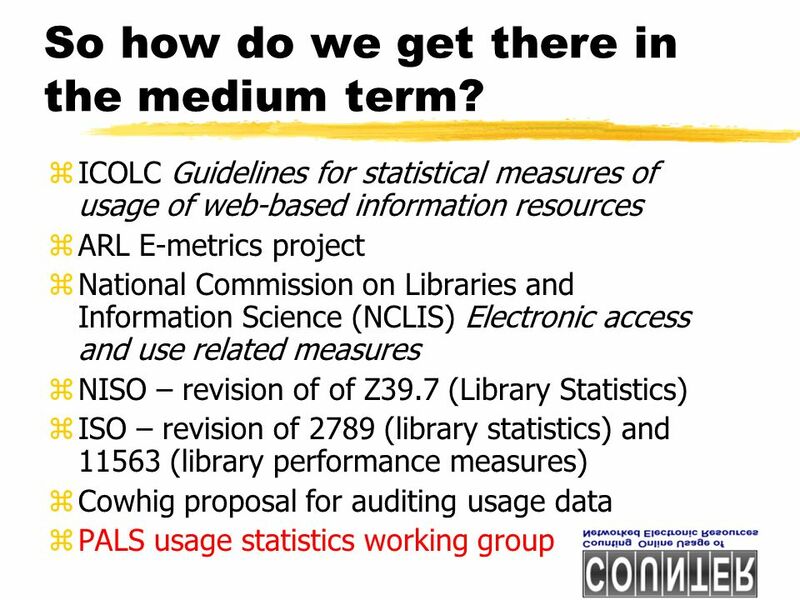 1 FUTURE DIRECTIONS FOR COUNTER AND USE STATISTICS David Goodman Palmer School of Library & Information Science Long Island University. 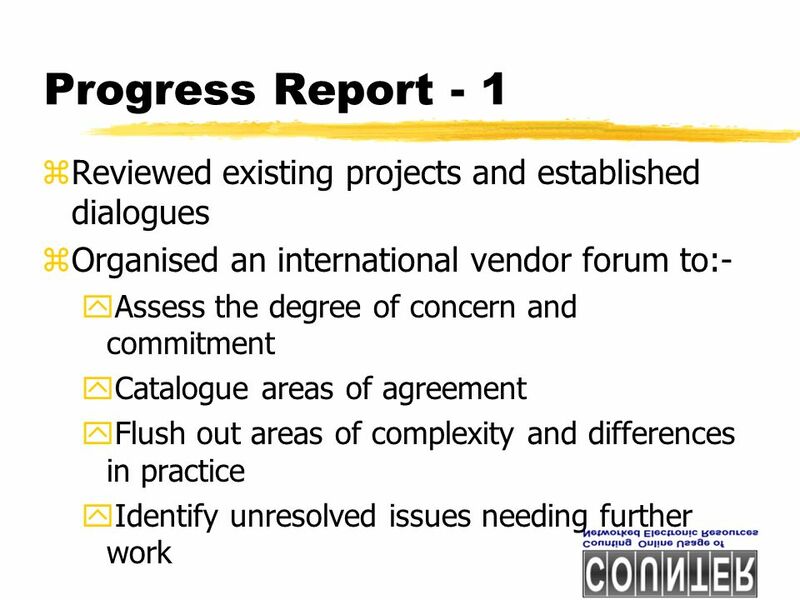 Progress towards a trouble-free knowledge base supply chain Charlie Rapple KBART co-chair UKSG, March 2009. Kathy Perry, VIVA Director With special thanks to Peter Shepherd, COUNTER Executive Director Electronic Resources and Libraries Conference March 19, 2014. The Usage Factor Project Update Richard Gedye, Research Director, Oxford Journals UKSG Conference Torquay 31 March – 2 April 2009. COUNTER: an overview Peter Shepherd Project Director COUNTER Usage Statistics Training Seminar, Oxford, 9 December 2005. 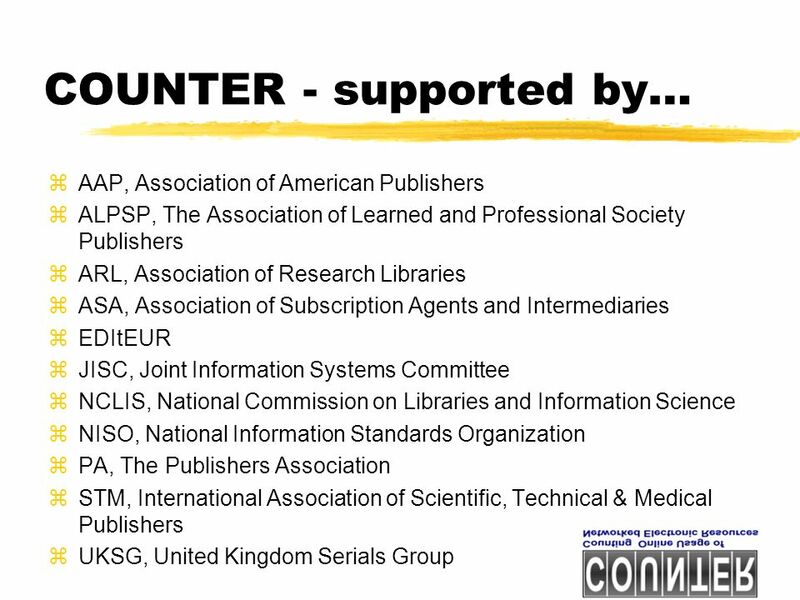 The COUNTER Code of Practice for Books and Reference Works Peter Shepherd Project Director COUNTER UKSG E-Books Seminar, 9 November 2005. 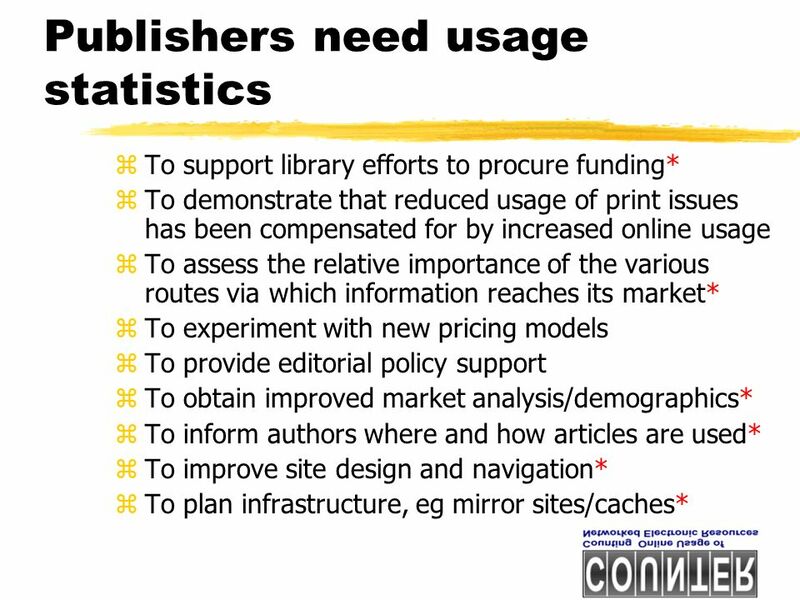 A Publishers Perspective on Serials in Changing Times Patricia Hudson Associate Director of Institutional Marketing Online Products Oxford University Press.